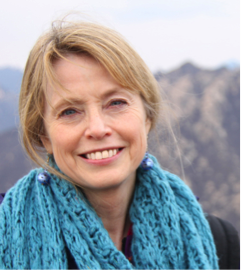 Today we are excited to feature picture book author and illustrator Susan Eaddy. 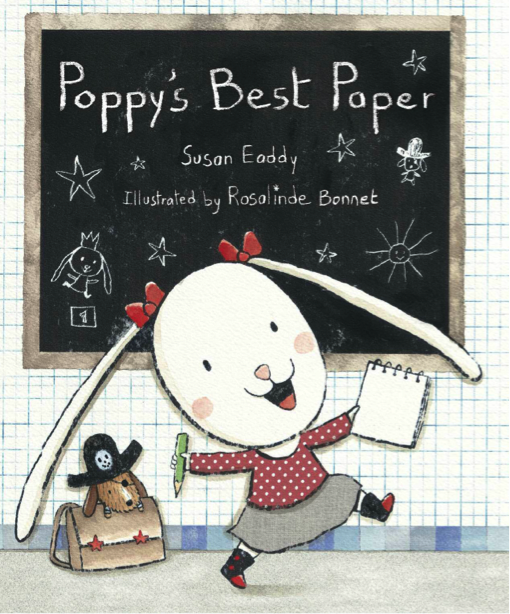 Her first picture book as an author, POPPY'S BEST PAPER (Charlesbridge), just released in early July. Be sure to enter into her giveaway: your choice of POPPY'S BEST PAPER or MY LOVE FOR YOU IS THE SUN! I was a voracious reader as a kid and my 5th grade teacher instilled a love of writing. She assigned a composition for us to write each week, and it was my proudest moment when Mrs. Beaton read mine aloud to the class. That same year my Mom bought me a poetry drawing book, with a blank page to illustrate each poem. I loved it! The seeds for writing and illustrating were sown in my 10th year and I think my mental age has stopped right there! I was an art director for 15 years for an educational publisher and for RCA Records, and did freelance children’s illustration at night. After I left RCA it took FIVE years of attending conferences and sending out postcards before I was given a book assignment. 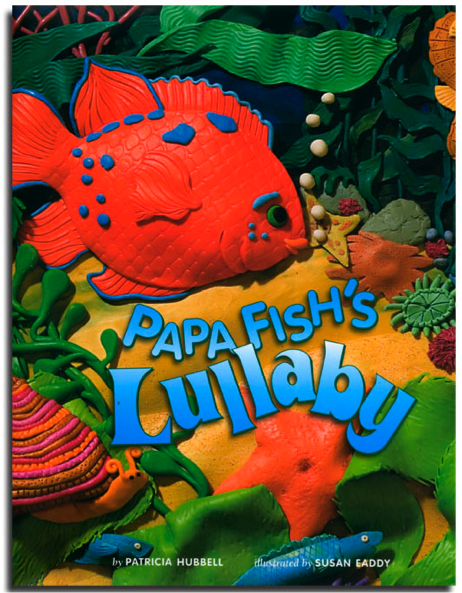 PAPA FISH'S LULLABY by Patricia Hubbell was my first trade book. 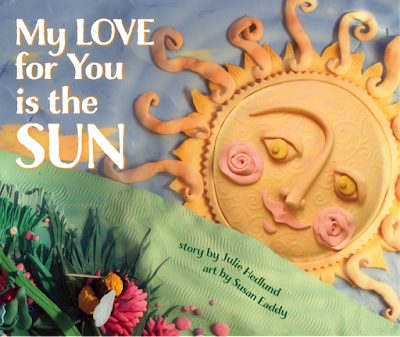 That was followed by 3 board books with the Smithsonian (now out of print), MY LOVE FOR YOU IS THE SUN by Julie Hedlund and POPPY'S BEST PAPER, illustrated by Rosalinde Bonnet …my first authored book! What do you consider youself? Author? Illustrator? Author-illustrator? That’s tough. 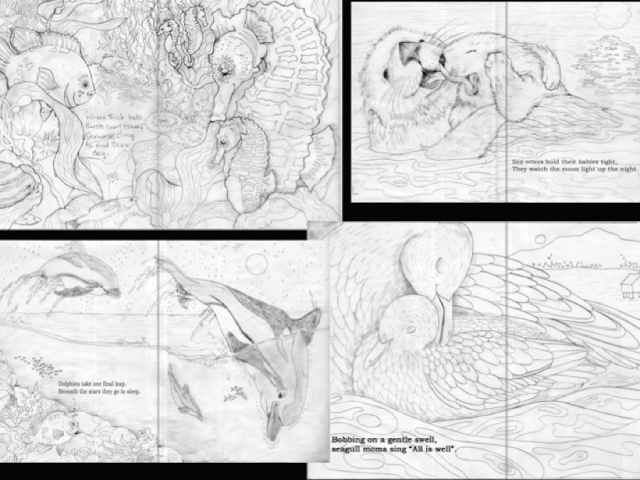 I have been published as an illustrator only and as an author only. 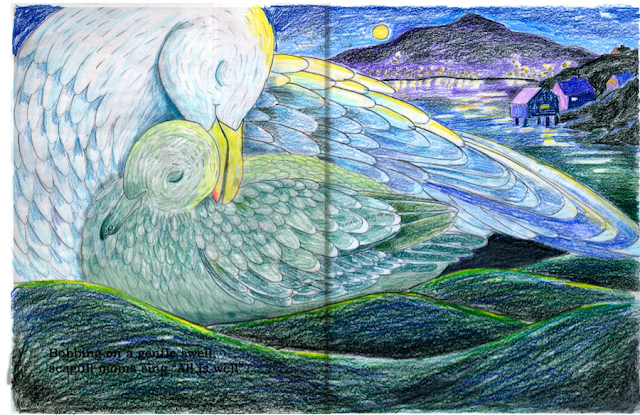 But I have MANY ideas as author/illustrator. So maybe all 3? Your latest PB, POPPY'S BEST PAPER, was illustrated by someone else. How was it to see your story be brought to life by someone else? Did she have a different vision than what you pictured? I feel SO fortunate that Poppy was paired with Rosalinde Bonnet. Rosalinde added a dimension to Poppy that I did not imagine. Rosalinde made her so endearing and lovable when she could have easily become annoying. She maintained that spunky confidence of her flawed personality and the overflowing energy and zest for life. Plus, she created such a delightful world for her and Lavender to reside in. Your illustrations are so distinctive. 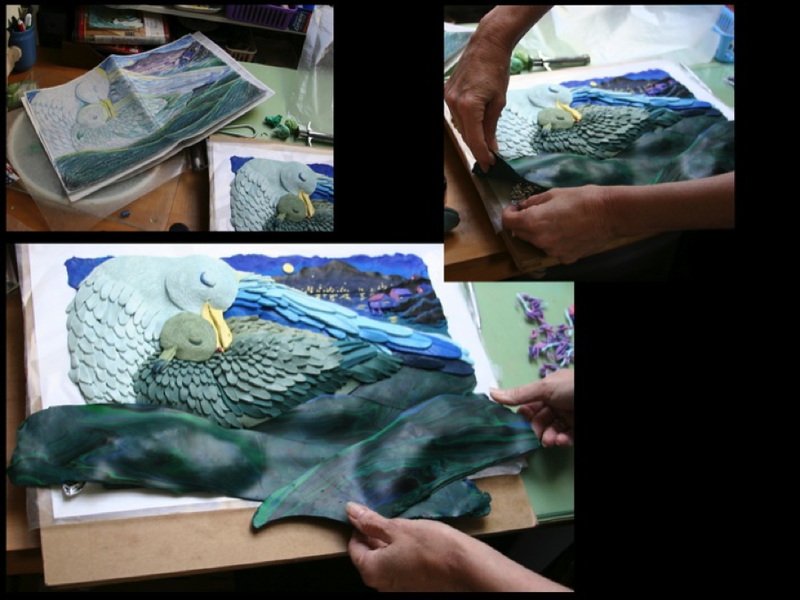 How did you come to illustrating in clay? I had an uncle who taught ceramics at the college level. He made a clay dragon for me when I was 9 years old and I was instantly FASCINATED. For an adult to make their living at playing in the mud! What could be better? Although I worked with fired ceramics in college, it wasn’t conducive to illustrating. I saw Barbra Reid’s illustrations around that time and again became FASCINATED. I enjoyed exploring the layering process of using cut paper, and decided that layering clay was not that different. One of the things I love about it is that I don’t know how to do it, and every illustration becomes a problem–solving exercise. That’s what keeps it fun…trying to figure out HOW to create my scenes. Plus, I love the tactile experience of PLAYING in the clay and the constant exploration with textures and layers. First is the research. Which I LOVE. 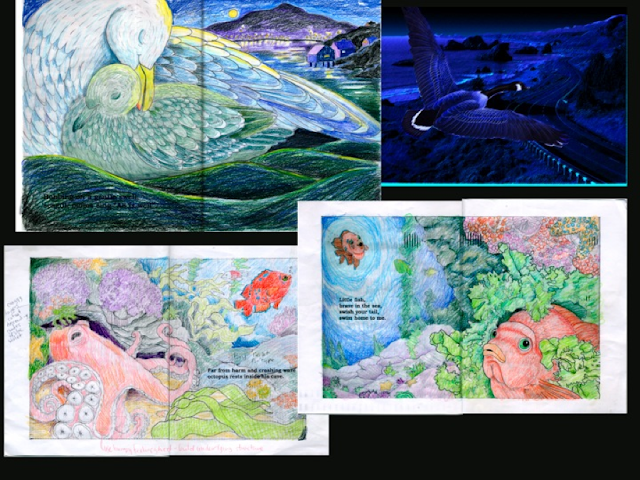 Even if I am illustrating for fiction, I have an internal logic… all the animals live in the same habitat….the foliage is also true to life…I love to start with reality. After I establish setting, I make many sketches to create characters.. then combine all for an extremely detailed drawing. Then I color! I print out several copies and start in with colored pencils to establish palette. Or I do rough color studies in Photoshop. Once I’ve established palette…I pin a color study up over my clay table and FINALLY start the clay. I use my sketch as a base for my clay. I lay down wax paper on top and start building layers until the piece is done. 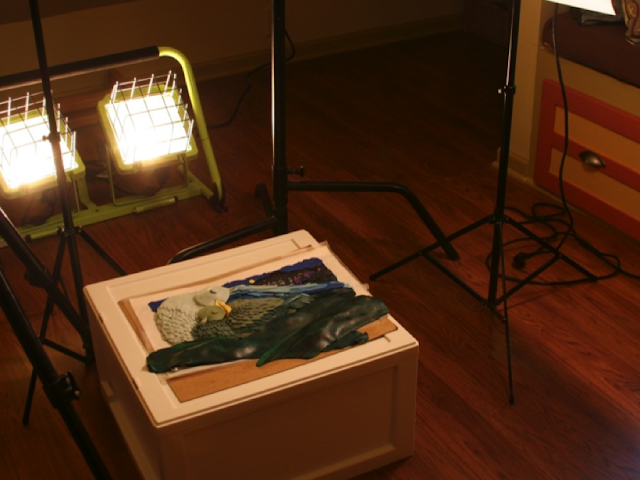 After the clay picture is complete, I take it to the photography part of my studio and shoot it. I experiment with lighting and natural light usually shooting both to see which translates best. I then put the digital file into Aperture, experiment with curves, color balances etc, import into Photshop, and see how it looks. I will often shoot a piece up to 10 times or more because until it is in 2 dimensions you can’t really see what works and what doesn’t. I play with it in Photoshop to fine tune. 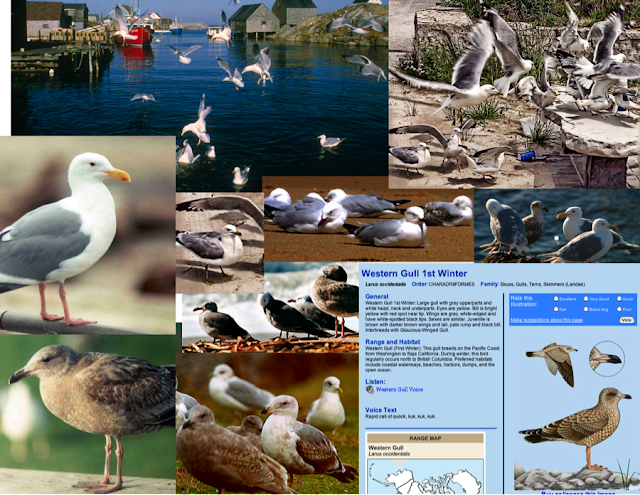 After I am satisfied with the (gigantoid) digital file, I send it to my client. 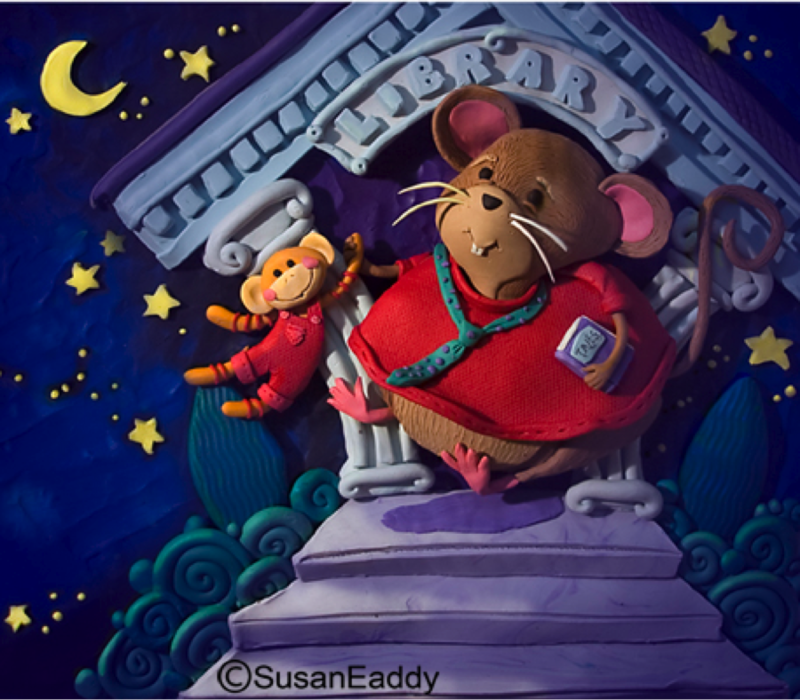 What is the hardest part of writing & illustrating for children for you? And the easiest? The hardest part of writing is the uncertainty. I sometimes think I have a great idea or story going only to have it be shot down over and over. It is hard to determine sometimes which criticisms are valid…whether I need to rethink /re-write or whether I need to dig in and persist. Then there is the submitting… that part is hard too. If you don’t submit then you can’t get rejected, right?! 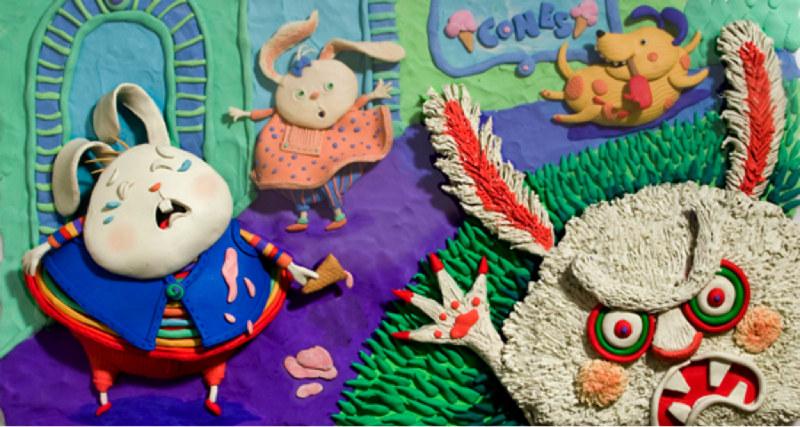 The easiest part of illustration is the clay work. After doing research, figuring out the composition, palette, settings etc…the hardest problem solving is over! By the time I start the clay, I can just enjoy the satisfaction of playing with clay and trying to perfect my craft. When my fingers are busy with clay… my mind often wanders to my long & ever present To-Do list. So I have discovered that listening to audio books keeps me in my seat and actually puts me into a chill zone. Nothing better than having someone read you a story; plus I consider it research! A manuscript I wrote, titled THE WORRIED WISEWOMAN. I am working on the dummy and illustration samples in my baked clay style. This was inspired by the delightful Folk Art style mosaics of the Byzantine churches in Italy. I’ve been fortunate to travel to Italy often with my Art Professor husband, and again I have become FASCINATED by this style and endearing naivety. I had 2 red bellied newts who lived for 13 years. Their names were Olivia Newt and John. Susan Eaddy works in her attic studio writing picture books and playing with clay. She was an Art Director for fifteen years, and won international 3D illustration awards and a Grammy nomination. Her clay illustrated trade books include MY LOVE FOR YOU IN THE SUN by Julie Hedlund and PAPA FISH'S LULLABY by Patricia Hubbell. She is the author of POPPY'S BEST PAPER illustrated by Rosalinde Bonnet. She loves to travel and has used the opportunity to do school visits anywhere in the world from Taiwan to Brazil to Alabama to Hong Kong! Such gorgeous illustrations! Congratulations on these books - can't wait to read them all. Thank you Beverly! I'm grateful to have art and books in my life. I am totally cracking up over Susan's newt names. :D I'm such a huge fan of Susan's detailed, laborious and gorgeous art and can't wait to admire her written work as well! hi Tersea! With your ever present menagerie, I'll bet you have had some newt friends, if not in your house at least on your farm! So impressive! Love POPPY'S BEST PAPER, too! Thank you Lori! It has been a different but delightful experience wearing the author hat. Thanks Susan for sharing your journey! 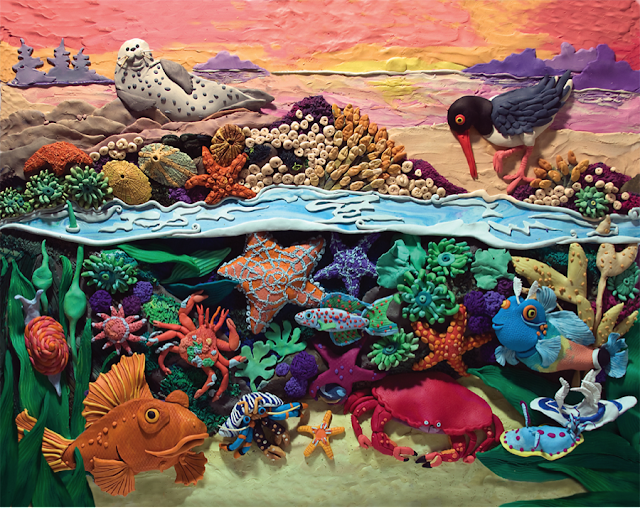 Your clay process is fascinating and congrats on your new book, POPPY'S BEST PAPER, too! Debra! I thank you and Poppy thanks you. Congratulations on your new book! I love your sweet characters and beautiful art. I'm especially in love with your bunny characters. 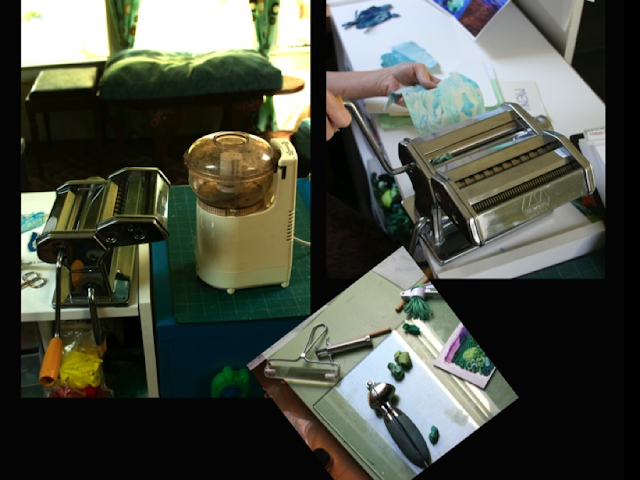 Thank you for sharing your process. Thank you Darlene! I kind of have a thing for bunnies & was so glad that Rosalinde Bonnet made Poppy a bunny in her illustrations. LOVE your art work and your process is fascinating! Thank You for sharing!! Can't wait to read about Poppy!